Joshua Guymon is a small town sheriff in the mostly Mormon Star Valley of Wyoming Territory. This is back in the days when to be Mormon was to be an outsider in the American West. His younger prodigal brother seems to have settled down from his wild ways and married. Joshua goes to meet his brother's bride and see how the newlyweds are doing on a ranch in the southern part of the territory. But trouble has a way of finding Joshua, from a crooked gambler to a highwayman to an escaped prison killer. What starts out as a social visit to his brother becomes a western adventure and a decision between his faith and being a US deputy marshal. This was a highly entertaining read from the first page to the last base on western life and one man’s faith how he will bring justice and stay true to it. I really love everything about this story it is full of excitement, adventure, danger, justice as well as compassion. Mr. Tyler’s does an outstanding job making this audio very realistic with voices and tones that fit the part of the Wild West. There are no repeats of wording, no changing of volume and no background noise just a smooth clear and clean listen that really pulls you in. His males voices are just as wonderful as his females one. You always know who is talking and what emotion they are feeling. You can really hear the laughter, sorrow in his voice making this more of a movie that really pulls you in. He has a voice that I had no trouble listening to and fit the character. I was so pulled into this story I didn’t want it to end. The narrator puts true emotion into this audio giving you a very entertaining listen. I had no trouble picturing the scenes as they unfolded, I almost felt like I was there seeing it live. I have not listened to anything by this narrator. I am really looking forward to checking out more of his work. The author puts a lot into small time frame with no fillers just fact that gives the readers everything they need to know. I never felt anything was missing or lost every word gave meaning to a delightful story. You are given such vivid details you have no trouble picturing the scenes the author as put together. The only thing I could complain about is it wasn’t long enough. I really got into this story and loved the characters. From my understanding of the Mormon faith the author was true to it, giving the reader a little more understanding. There were times I held my breath thinking this can’t be good as my heart started beating double time. I really was taken back in time being held on the edge of my seat waiting to see just how justice would be found. I haven’t read anything by this author and found him to be a delightful. I love his writing style. He has a way of pulling the read in from the first page until the end. I am really looking forward to reading more of his work from this very talent author. I got this ARC via audiobook boom. I loved this story. It gave insight into Dannites and Mormons. The marshal was very good at his job yet still kept his faith. The story was very well developed and kept me listening. If you like westerns this is a good one. The narrator of this audiobook was good and I'll seek out other books he has done. The story was pretty good and had an interesting point of view from the Mormon character. Plenty of action with a good message -- pick your friends carefully. I'm a sucker for a good western so I would spend a credit on this story. I received this audiobook for free in exchange for an unbiased review from Audiobook Boom. This was a highly entertaining read from the first page to the last base on western life and one man’s faith how he will bring justice and stay true to it. I really liked everything about this story it is full of excitement, adventure, danger, justice as well as compassion. great development of the characters. I really could connect with them and wish I was there. I don't read or listen to Westerns often, but I am glad I decided to check this one out. This was a Good Western read. I look forward to more stories by this author. Ben Tyler did well with the narration. Cowboys and Gangster, whats not to love? “I was voluntarily provided this free review copy audiobook by the author for an unbiased review." So that said I liked the audio and would listen to it again in time. I didn't read the book first but could see the characters with miy minds eyes while listening and thats no easy fead to gain. I could see Joshua and his little brother Mickey. I could see the mountains and the trail and I could see the sneer on Haggarts face. If you like story about cowboys, lawmen and gangsters this is a book for you than. I was provided this audiobook at no charge by the author, publisher and/or narrator in exchange for an unbiased review via Audiobook Boom. I fully enjoyed the writing and narration of this audiobook. 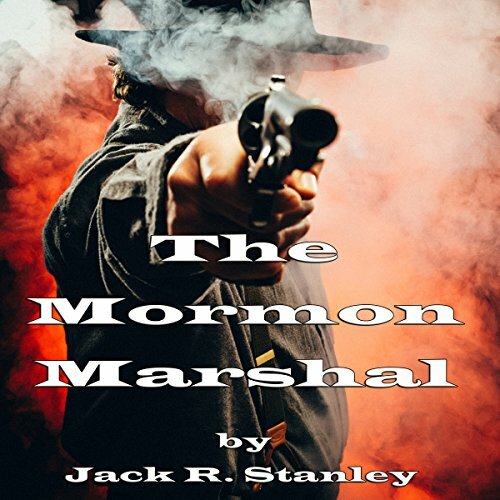 I don't know if the author is Mormon, but being on myself, I was very pleased with the accurate portrayal of the Mormons who settled in Utah and surrounding areas, and the historical and religious aspects. The narrators voice was perfect for a rough and rowdy cowboy. The story reminded me of some written about the famous Porter Rockwell, Billy the Kid, and Butch Cassidy. The audiobook is just under three hours and was a perfect short listen. A historical western fiction that's somewhat different than other books I've listened to. I'm not well versed on the Mormon faith so I can't honestly say if the story was factual. There was some romance, adventure, and the quest for justice. This seems like an introduction for continuing stories, at least I hope so. The narration was well done.The characters were well portrayed by Ben Tyler.